Gluten free, primal, low carb mini chocolate cheesecakes with a nut butter topping. 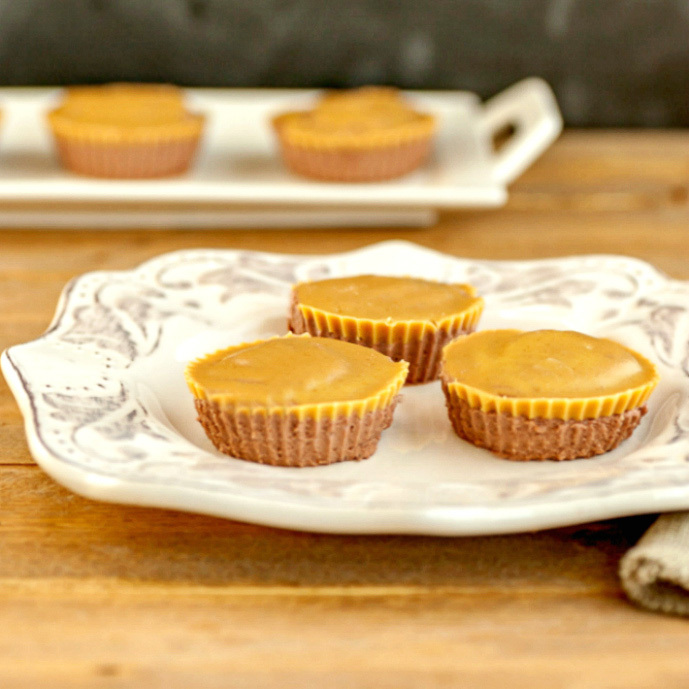 So excited about these Chocolate Peanut Butter Mini Cheesecakes! 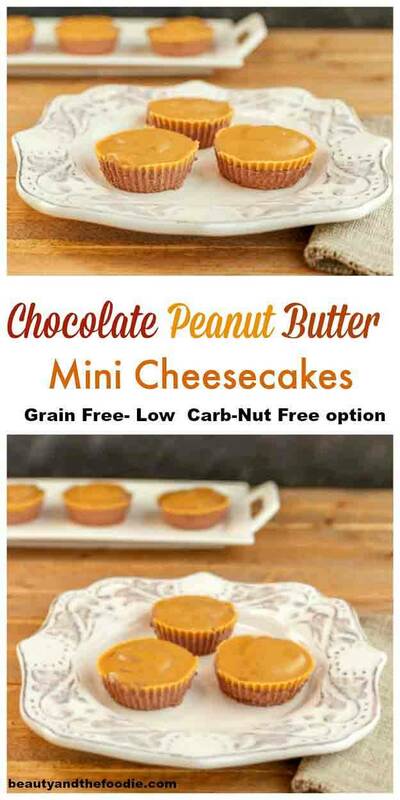 They are easy, crust free, no bake, primal and low carb mini cheesecakes with the “Reese’s PB Cup” flavor. A chocolate mini cheesecake with a nut butter topping. 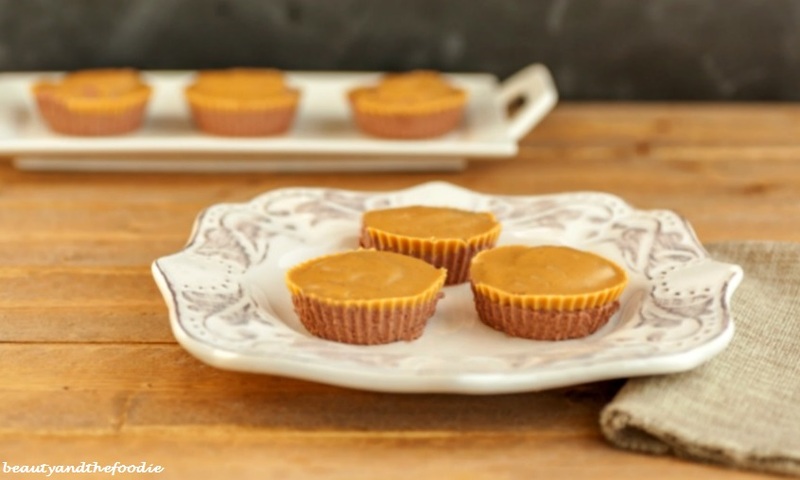 You can use almond butter, peanut butter, or sunflower seed butter for a nut free option in this recipe. My son went absolutely bonkers for these! 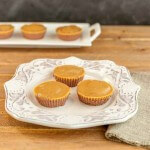 Oil or grease a silicone muffin pan or muffin cups. In a stand mixer or large mixing bowl with electric hand mixer combine: softened cream cheese, ricotta cheese and vanilla extract. Mix together on medium high to high speed, and scraping sides with a rubber scraper until combined. In a separate large glass or ceramic mixing bowl combine: ⅔ cup sweetener of choice, 2 ½ tbsp cocoa powder, and 1 envelope gelatin. Stir together. In a teapot or sauce pan bring one cup of water to a boil. Pour ½ cup of boiling water into sweetener cocoa gelatin mixture. Stir thoroughly until combined and clump free. Turn on electric mixer or stand mixer with cream cheese mixture, and slowly pour cocoa gelatin hot water mixture into cream cheese mixture. Keep mixing and scraping sides until combined. turn off mixer. In a small sauce pan over medium heat combine all the nut butter topping ingredients and melt and stir together until combined and melted. Remove from heat. Spoon chocolate cheesecake mixture into muffin pan cups or muffin cups about ⅔ full. Spoon 2 tsps melted nut butter topping over each cheesecake top. Freeze the pan of cheesecakes for about 2 hours or until solid enough to remove from pan or cups. Keep unused portions in freezer, and just defrost for a few minutes before eating each time. Nutritional Data for Low Carb Version (Using Swerve sweetener): Servings: 1 mini cheesecake out of 12, Cal: 150, Carbs: 2.5 g / Net Carbs: 1.5 g, Fiber: 1 g, Fat: 14 g, Protein: 5 g, Sugars: 0 g, Cholesterol: 36 mg, Sodium: 105 mg.
Nutritional Data for Primal Version, (using coconut sugar sweetener): Servings: 1 mini cheesecake out of 12, Cal: 198, Carbs: 16g, Net Carbs: 15 g, Fiber; 1 g, Fat: 14 g, Protein: 5 g, Sugars: 14 g, Cholesterol: 36 mg, Sodium: 105 mg.
Can you use splenda as a substitute? Hi Paul, I’m sure you could. I don’t know the conversion amount though, as I’ve never used it before. Vicky, coconut butter would be an awesome nut free version. Made this as the recipe said and it was wonderful. Tonight though, I made it again and instead of using cocoa powder and gelatin I used a pkg of sugar free strawberry jello. Knew it would either be really good or really bad. It was amazing. Totally satisfied my pb&j craving. Made it as a normal sized cheesecake though instead of the frozen snacks.